The story behind these whimsical bronze animals. These beloved sculptures are the work of Tom Otterness. To make the museum more inviting, the Northwest museums of Arts and Culture (or the MAC) installed the sculpture series, The Return of the Four-Leggeds. These sculptures are an exhibition, permanently on display outside of the museum and in the amphitheater. The statues are created with children in mind when asked Tom Otterness said, "Almost always I make them with kids in mind and the main kid I make them for is me." 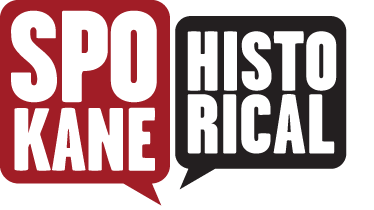 Before entering the museum take a few moments to think about these statues. How many individual sculptures can you find for this work of art? What do the sculptures seem to be doing? Why do you think these sculptures are so active? "The Animal people have come with a contract to buy back the world from the Two-Leggeds. The Weasel is negotiating while the Salmon prepare the way to return to the river. The Marmot is already in the amphitheater, munching on small change." 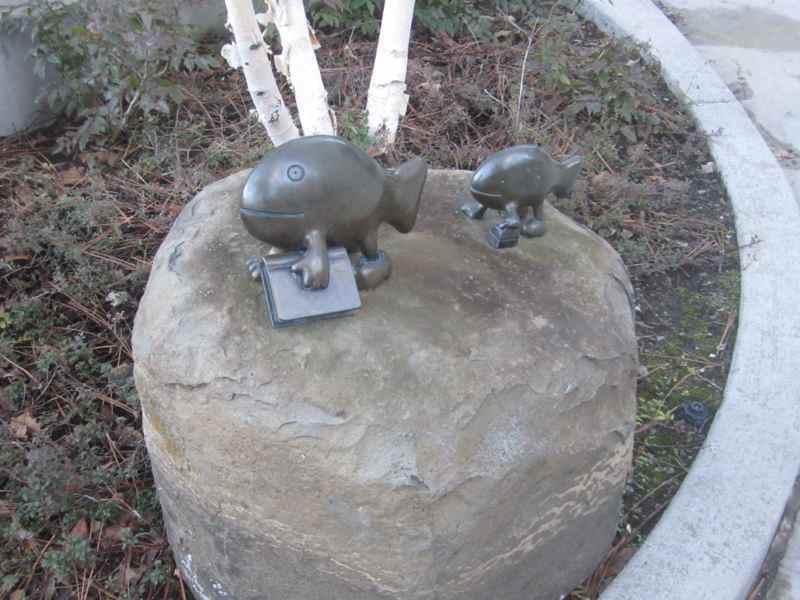 These statues present a fun an inviting look into social commentary as well as simply being pleasing to the eye. There are 9 bronze statues in all, can you find all of them? 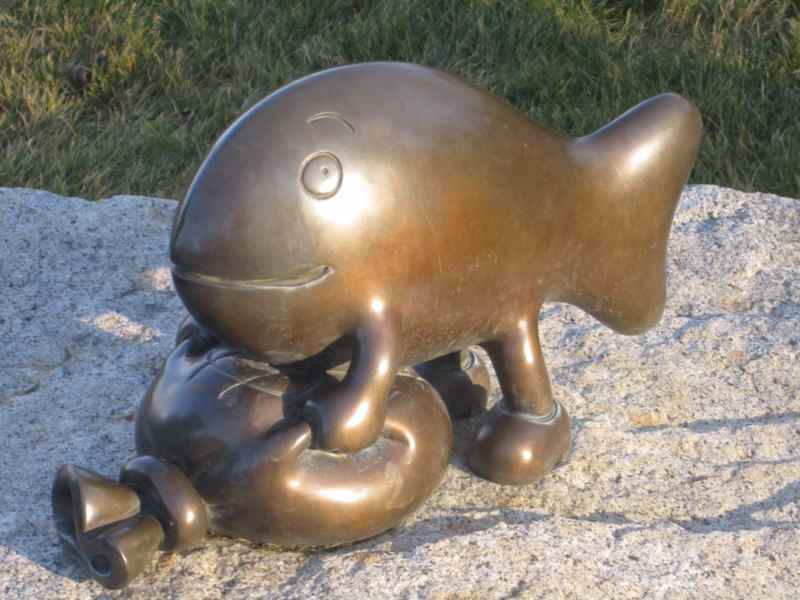 Fishy Money: One of nine sculptures in the 'Return of the Four-Leggeds' sculpture series by Tom Otterness. Image courtesy of Zachary Wnek. Must Please the Rat. 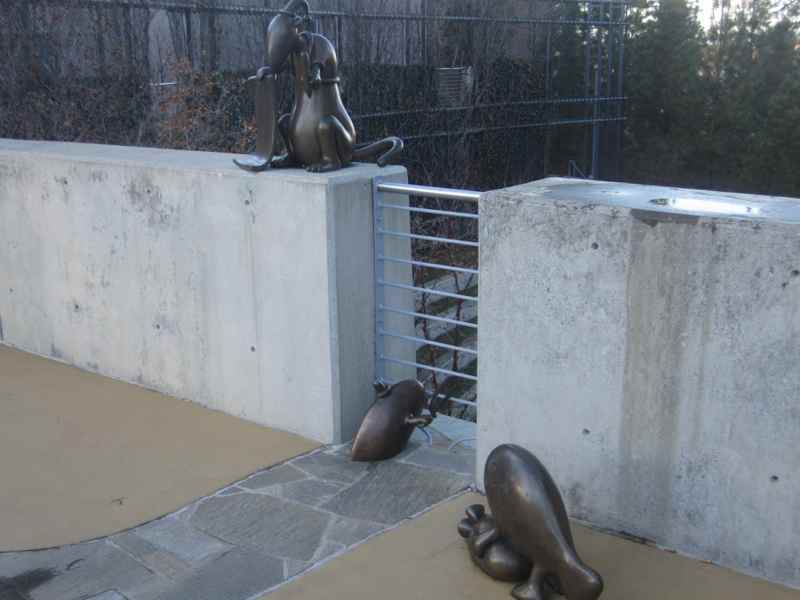 : Three of nine sculptures in the 'Return of the Four-Leggeds' sculpture series by Tom Otterness. Image courtesy of Zachary Wnek. 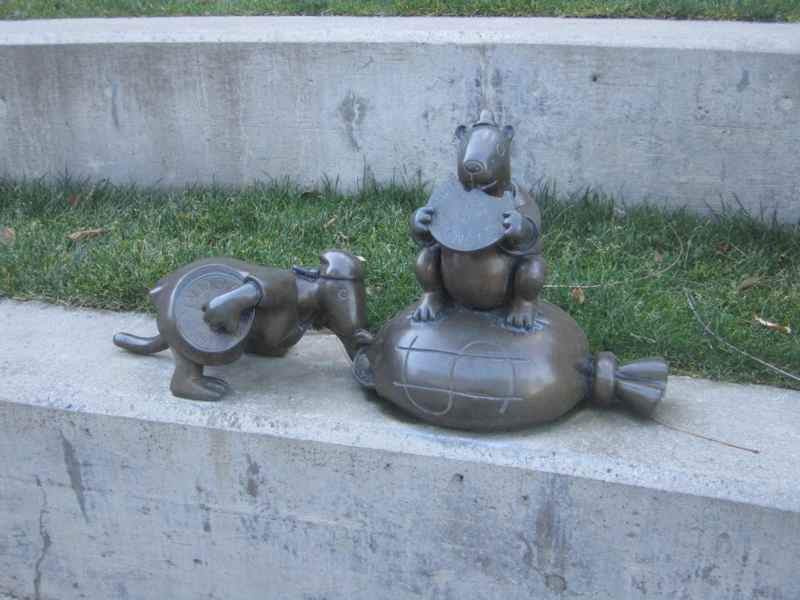 Mice with Money: Two of nine sculptures in the 'Return of the Four-Leggeds' sculpture series by Tom Otterness. Image courtesy of Zachary Wnek. The Scribe: Three of nine sculptures in the 'Return of the Four-Leggeds' sculpture series by Tom Otterness. Image courtesy of Zachary Wnek. A School off to School. 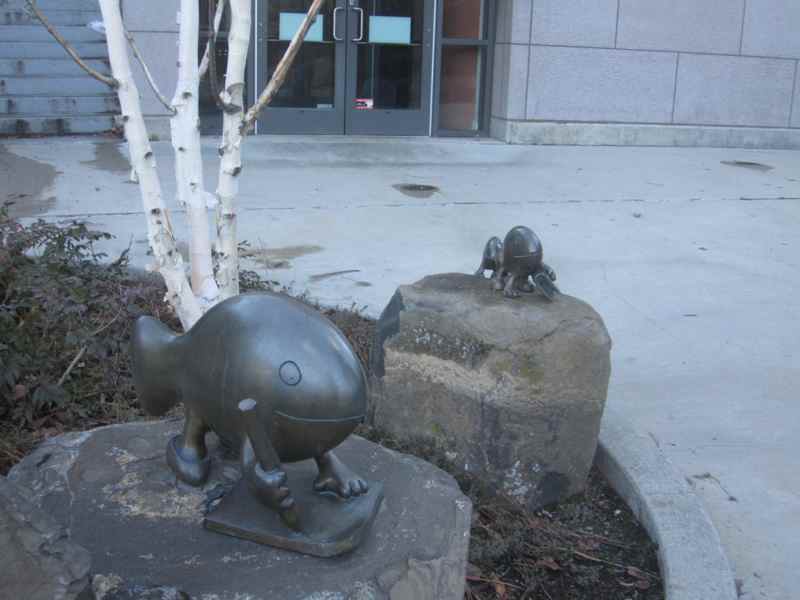 : Two of nine sculptures in the 'Return of the Four-Leggeds' sculpture series by Tom Otterness. Image courtesy of Zachary Wnek. Zachary Wnek, “Return of the Four-Leggeds,” Spokane Historical, accessed April 24, 2019, https://spokanehistorical.org/items/show/287. Lauren, Tom Otterness Studio. "RE: Form Submission," November 16, 2012. "Behind-the Scenes with World-Famous Artist Tom Otterness." Accessed April 24, 2013. http://www.scholastic.com/browse/video.jsp?pID=1648673895&bcpid=1648673895&bclid=1699105479&bctid=96851894001.